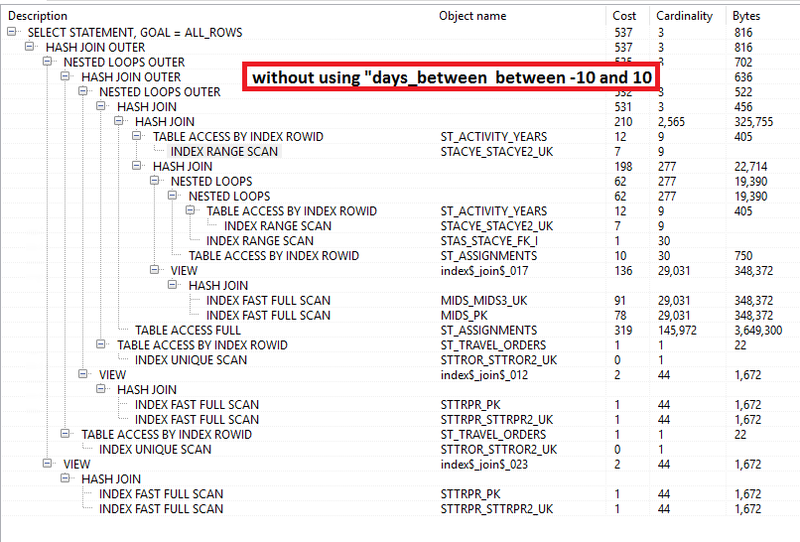 Oracle performance question - why does a query filter of "where DAYS_BETWEEN between -10 and 10" take so long? But when I query the whole thing and say "where days_between_trips between -10 and 10", the query never returns ! The problem is a person taking four trips with a short break between trips, trying to get days_between each trip. *** --> "and days_between between -10 and 10", the query never returns. I figured the data would be pulled into memory (483 rows) and then it's a simple matter to take this and filter out those rows not meeting the days_between criteria. Why am I seeing this scenario ? It's a enterprise system, everything seems good, etc. 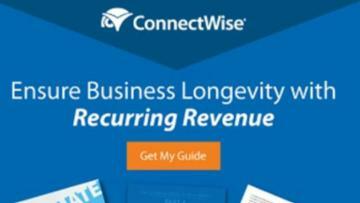 look at the explain plan with and without the condition. I think what you'll find is the new condition is being pushed into at least one of the unions of the inline view, possibly all of them. The optimizer "thinks" it will be a helpful condition to prune the results. But instead, it's taking a longer path. This could be due to invalid/stale statistics. If the above scenario is not what you are seeing, then please post dbms_xplan.display output (text, not screen capture images) of the plans of both versions of the query. I was just curious on this, it does look like it's being pushed back to the view, which calls a function which does this and that. I was thinking it get the data set first and then apply the criteria, but apparently not ! I do need to get our performance awareness upgraded, but with our primary table having 30,000 records, no one bothers about it . . .
very nice ! I can try that this weekend. I tried the /*+ MATERIALIZE */ today and it seems to work ! I'll have to talk the whole thing over with the DBA. I did the EXPLAIN Plan with and without "days_between between -10 and 10". They're somewhat the same but WITH "days_between" it actually looks cleaner, see attachments. What I DON'T see is the EXPLAIN PLAN for a function that is called from the view(s). The function is used for the "end date trip 1" and "start date trip 2" which is where days_between comes from. The function does a complex query that calls 3 other tables that are not listed, PLUS 2 tables also in the main query, BUT it sure looks like the function is NOT included in the Explain Plan. And so for every record it's jumping through hoops via the function to get the days_between. 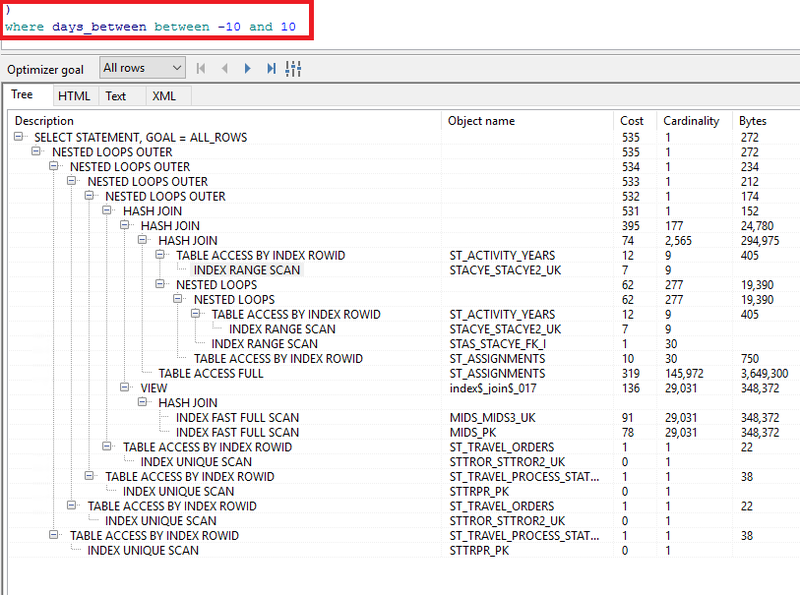 In the EXPLAIN PLAN there is one Table Access Full (ST_ASSIGNMENTS) although there's also a line that uses RowId Index for ST_ASSIGNMENTS. ST_ASSIGNMENTS has 150,000. I just ran the query again with the "days_between" criteria, it didn't come back after 30 minutes. Attached is the Explain Plan for the function. It looks clean but it never returns with the "days_between" criteria.